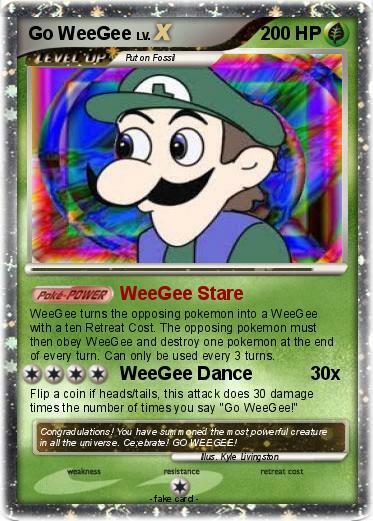 WeeGee turns the opposing pokemon into a WeeGee with a ten Retreat Cost. The opposing pokemon must then obey WeeGee and destroy one pokemon at the end of every turn. Can only be used every 3 turns. Flip a coin if heads/tails, this attack does 30 damage times the number of times you say "Go WeeGee!" Comments : Congradulations! You have summoned the most powerful creature in all the universe. Ce;ebrate! GO WEEGEE!